On my spirit make music too. — these opening lines from "Peter Qunce at the Clavier" by Wallace Stevens and Mozart's gorgeously delicate music alo buoyed the Mark Morris dancers to enchant audences at Lincoln Center's 50th anniverary Mostly Mozart Festival. Having covered the arts scene in the Berkshires for many years, I've enjoyed the Mark Morris Dancers at that area's Jacob's Pillow, and Olsen's annual appearances at the Tanglewood Music Festival. Wonderfully enjoyable and atmospheric as the Jacob's Pillow dance performances are, there's no pit and the music is generally recorded as is the case at most dance venues. On the other hand, at Tanglewood what you see on stage at a concert featuring Ohlsson, is the pianist and the Boston Symphony Orchestra. There is no dancing but it consists of of Ohlsson's fingers on the keyboard; and this big man does indeed have the delicate touch of a dancer. At the Koch Theater, Ohlsson was seen only when he stood up to take a bow. Instead the three Mozart works for piano and orchestra were given vivid visual life on stage by the Mark Morris dancers lending their signature leaps and body language to Morris's visual interpretation of these works. It was a treat for me as well as everyone smart enough to buy a ticket. Unsurprisingly, the orchestra in the pit with Mr. Ohlsson as helmed by Louis Langree was in fine form. Israeli pianist Inon Barnatan who joined Ohlsson for the program's middle piece, "Double" (to Mozart's Sonata in D Major for Two Pianos) enhanced the robustness of the music and dancing. Together the musicians and dancers proved that, contrary to many choreographers and musicians' opinions, Mozart isn't just for listening, but very danceable indeed. The separately created scores are connected by Mr. Morris's way with repetition, combination of leaps and ground hugging, hand gestures, and an emotional sense of narrative, build beautifully. It starts with "Eleven" (to Concerto No. 11 in F Major) which features mostly female dancers, and moves on to the middle piece focusing on men. There's a vague sense that there's a story of love, realized and not realized, that reaches a crescendo in the post intermission "Twenty-seven" that makes us see everything in the way of movements and everyone in the superb ensemble coming together. 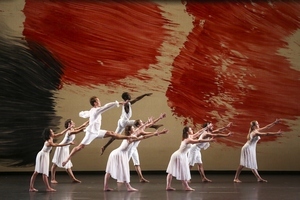 Costumer Martin Pakledinaz, whose work I know from reviewing stage plays and musicals, has dressed the dancers to echo the look and feel of the giant feathery paintings by Howard Hodgkin projected on a backup screen. Lighting designer James F. Ingalls (another theater, dance and opera hopping designer) enhances and deepens the link between Hodgkin's abstract images and the mood being expressed by the dancers. If Mozart oould come back to earth long enough to see these works written during his time turned into a visual fantasia, he'd be right there joining the audience in their bravos.